What's your favorite summer court? Four iconic Summer Courts are making their way to NBA LIVE Mobile. Vote for your favorite from July 10-17, and win a special giveaway pack in the store based on the winning court! Don't let the tranquil beach fool you. Featuring some of the country's most intense pick-up ball, L.A.'s famous court is where celebrities, NBA stars, and streetballers go to be seen. Summer in New York means streetball is in season. The proving ground for numerous NBA Players, if you can make it here, you can make it anywhere. Featured in many television commercials, and a favorite for locals, this legendary court located underneath the “L” represents the essence of playing Chicago basketball. This court isn't about hype, it’s about competition. It's where the Emerald city's best from every level go to master the art of basketball. What's your favorite summer court? 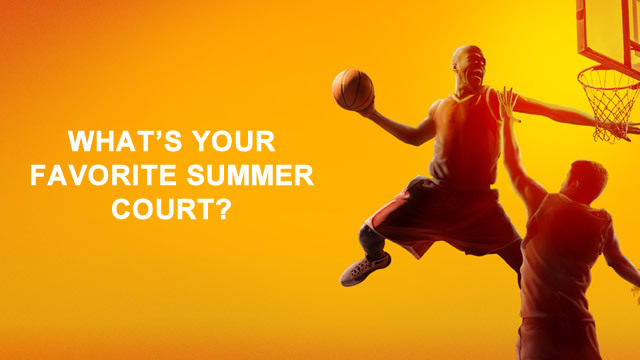 You can cast your vote on what is your favorite NBA LIVE Mobile Summer Court here!